You should never look directly at the sun, but there are ways to safely observe an eclipse. The sun is our nearest star and a warm light in the cold depths of space. It can also be a tantalizing target for skywatchers during solar eclipses and rare planetary transits across its surface, when viewed from Earth. But the sun is, first and foremost, a bright star and observers must take care during observing sessions. Warning: NEVER look directly at the sun through binoculars, a telescope or with your unaided eye. Serious eye damage and even blindness can result. Scientists and experienced skywatchers use special filters and glasses to safely observe the sun. Some methods are described in the SPACE.com Infographic above. A pair of binoculars can also stand in for the pinhole, with the light from the sun being projected onto the blank card through the eyepiece. 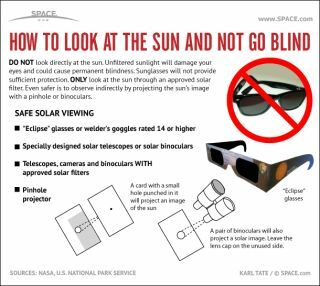 Special eclipse glasses and welder's goggles rated at 14 or higher are also acceptable for solar viewing. NEVER use regular sunglasses to observe the sun as they do not provide adequate protection.